If you’re not already sweating with anticipation, just from the title of this blog post, you may wish to tune out. This is a geek session. I got my IngoVision backup camera installed yesterday, along with the Mid-City Engineering interface module for the Mercedes COMAND unit (that’s the factory-supplied “all in one” box for the radio/CD/DVD/nav/Bluetooth/iPod etc.). The result has been exactly what I was hoping for — a good, clear, full-color rear view while towing. Here’s how it attaches to the car. The Ingo “PremiumCam” kit includes a very tough external connector which we mounted on a gusset attached to the receiver hitch. It looks just like a miniature version of the 7-way connector for the Airstream. 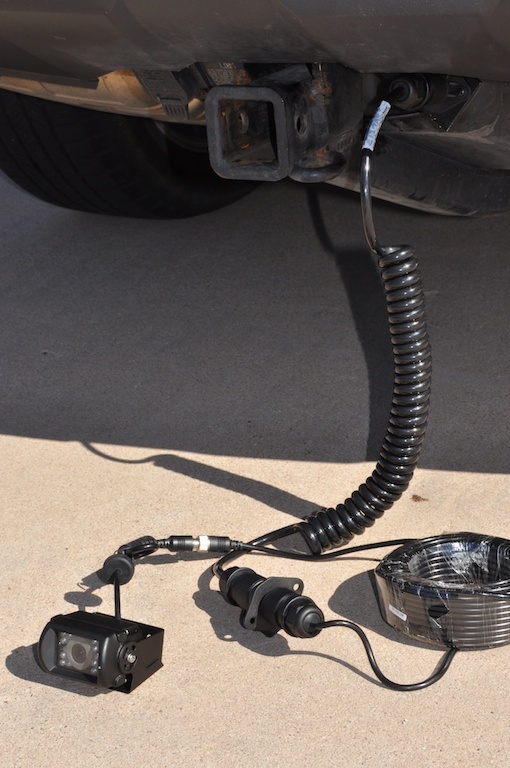 The rest of the kit (left, click for larger view) includes a coiled cable that runs between the Airstream and the Mercedes, a second plug to mount on the tongue of the Airstream, and a long run of cable that will go to the back of the Airstream. The camera will mount on the bumper compartment lid at the back of the Airstream. Inside the car, the Mid-City VIM164p interface box was attached to the back of the COMAND unit, and the camera cable was connected to the COMAND’s backup camera input. That part of the installation is completely invisible, since it is all hidden inside the dashboard. In the picture above at left, you can see all the cables and camera plugged into the Mercedes for a test, since I haven’t yet put it on the Airstream. Ingo mounted the Airstream plug on his propane tank cover, which is very slick and looks like a factory design. I’m mounting mine on the flagpole holder, which is bolted to the electric jack. The cable will run in a protected loom under the bellypan, so it should be a quick installation with some ties and rivets. 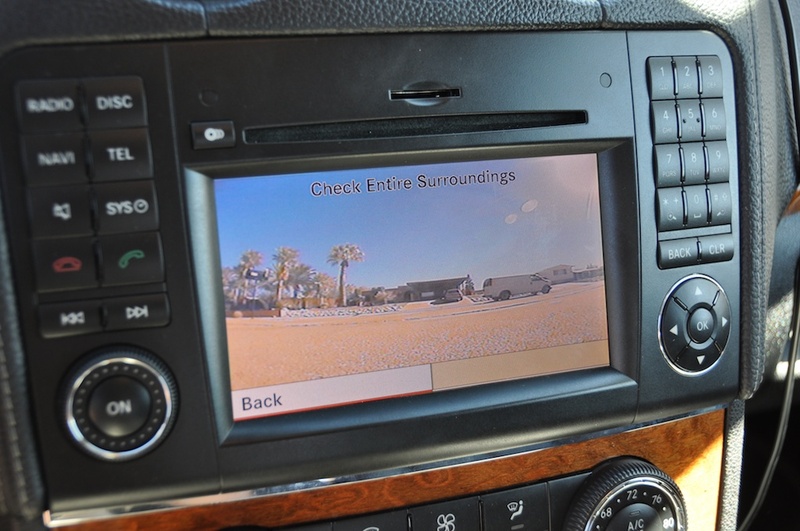 Up front, the interface module allows the camera to be tied into the COMAND system as if it were OEM equipment. I just press one button on the steering wheel and there’s the picture from behind the Airstream. It’s a little stretched, probably due to the difference in aspect ratio between the Ingo-supplied screen and the Mercedes screen, but it looks good. The camera also automatically activates when in reverse. The nagging text you see at the top of the screen is superimposed by the Mercedes COMAND unit, not the Ingo system. If you have a truck or SUV with more interior space, and don’t go for the fancy integrated nav screen deal that I did, you can get the same camera system for a pretty reasonable price. The IngoVision PremiumCam (two-camera) system runs $599. The BaseCam (one camera) system is $399. That gets you everything you need including the screen. Installation can be DIY, or you can bring it to a local automotive electronics store and have them do it in a couple of hours. I think this will qualify as a legitimate safety improvement. I’ve seen a lot of Airstreams with backup cameras (usually older models and Classic motorhomes), which suggests to me that at one time it was probably a factory option. Well, those cameras have come a long way since then — they’re smaller, cheaper, and have color, “night vision,” and better resolution. I think it’s time Airstream consider bringing back this option as a way to improve safety for owners. I can’t wait to get try this out on the road. My first chance will probably be in May when we shove off for the big summer/fall trip. I’ll report on our experiences with it once we get moving. we use ours all the time. ours has sound, this helps when backing up to allow hearing directions as well as signals. our rear camera has optional tilting allowing to ‘see’ further back or up close, actually can wide angle within six inches of rear bumper. This system looks like a great safety feature while traveling today’s busy highways. While we are usually moving slower than the general traffic (trailer tires rate at 65 mph) and pulling a wide body behind us, it behooves us to know what is going on to our rear (fire trucks, police cars, etc.?). Thanks for the idea. I will look into it when we get back from this trip.